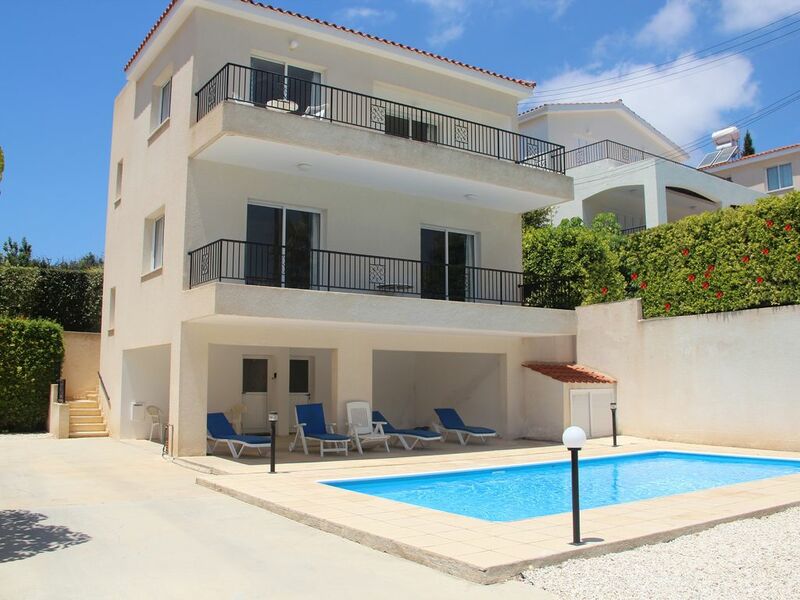 A well appointed Villa with air-con and ceiling fans throughout & comprises of a spacious lounge, separate kitchen, 2 large bedrooms (1 double 1 twin plus 2 zbeds) with fitted wardrobes,both with own balcony. A modern bathroom with shower over bath and wc. A further wc and wash basin on lower level. spacious lounge with balcony over the pool. Air conditioning throughout, INTERNET, UK TV , FILM PACKAGE, kettle, toaster, iron etc. To the front of the property (south facing) is a large garden with pool and covered area balcony off the main bedroom at first floor. These benefit from all-day sunshine and views over the large pool area and out to sea. To the side is parking for three cars - Less than 5 mins drive from the beautiful blue flag beaches and bustling town at Coral Bay, and is is a few minutes drive to the village centre of Peyia, where you will find shops, bars, restaurants, banks, chemists and other useful amenities.Only 30 minutes from Paphos International airport. frequent buses pass to most locations if you prefer not to hire a car or walk. air conditioning units double as heaters in the cooler months. also there are electric heaters avasilable to use. a set of bed linen is provided for your stay . plus a hand and bath towels are supplied for each guest. beach towels are not provided. Spacious living room with dining area (seating for 6). leading to balcony overlooking the swimming pool. Internet UK TV channels air-con and ceiling fans. Mount Olympus in the Troodos Mountains, 1.5 hrs drive, offers skiing and snowboarding during the winter months and offers breathtaking views for walkers out to enjoy the cool breezes during the summer. Three 18-hole golf courses are located within a 40 min drive from the villa: Tsada Golf Club, 20 mins, newly refurbished in 2006, Par 72. Secret Valley Golf Club, 35 mins, Par 72. Aphrodite Hills Golf Club, 40 mins, championship standard, Par 70/71. a driving range is only ten minutes drive away. This was our 4 year staying at the villa and as always had a fantastic time. We have already booked our dates for next year we enjoy it that much. Martin and Jules are always available if needed for anything. The villa is like a home away from home. Only thing that could be improved would be the pressure in the shower. there are numerous diving clubs for both the novice and experienced diver. The Corallia Beach has been awarded a blue flag and is a 5 minute drive away. It is a beautiful, sandy stretch of beach with a rocky peninsula at the far end, with shower facilities, toilets, sunbeds and ample car parking. There are many other blue flag beaches nearby and the beautiful beaches of Latchi and Akamas are approx a 30 min drive away. Coral Bay resort is also about 5 minutes drive away, with many restaurants, bars, shops and nightlife. Paphos Airport is approximately 30 minutes by car. Car hire is advised and we recommend arranging this prior to departure for airport collection. We can advise where to get a good deal. Driving is on the left as in the UK. Flights are available from most airports in the UK. Many airlines now fly directly to Paphos, including Easyjet, Cyprus airways etc. and fly from many UK destinations including Bristol, Manchester, Gatwick, Luton, Cardiff, Newcastle etc. Peyia 15 minute walk. Coral Bay 5 minute drive. Paphos 20 minute drive. Akamas Peninsula - 5 minute drive. Supermarket, fitness centre, a few restaurants, patisserie, hair salon, pharmacy, all in the peyia area a few minutes drive from the villa. Local hotels can provide tennis, squash, gym, beauty treatments. Peyia village has a wide choice of bars, restaurants, shops, takeaways and has a gorgeous old church in the village square.